Looking for inspiration to create an interesting and cohesive room? Start with one thing that you love and build around it. Your inspiration can come from any number of places – an area rug, some artwork, the fabric on an accent chair or accent pillow. Any of these sources are great places to stimulate inspiration. These three rooms have virtually the same color sofa in a soft hydra blue-green with completely different overall effect. In the first room, the sectional is accented with lively-colored toss pillows containing a range of red, orange and yellows with the soft blue and strong gray. Notice how the colors in the area rug, throw, tray and wall are all variations in the same color family. If they were all the exact same color, the room would seem very elementary and lack depth, but by building a color story the room has interest and liveliness without being overbearing. The palate of the second room is softer and serene. It is more neutral without being boring. This room keys off of the leaf-print artwork on the walls. 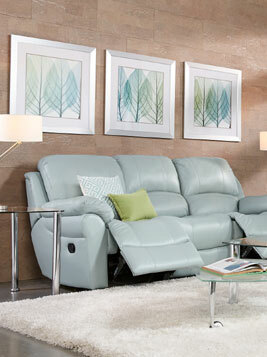 They pick up soft blues and greens that work well with the color of the leather sofa, without matching it exactly. The walls are in a neutral stone shade and a soft cream carpet to finish the look. The room is accented with soft and bright greens and silver accents on tables and frames. The flooring is a neutral gray. Room three works on a similar color scheme as room 2, but pulls in more yellow. This room’s color scheme plays from the striped blue rug which incorporates the aqua with beige and mossy green. Playing off of colors all on one side of the color wheel in similar intensity soft hues keeps the room soothing and clean. Choose “complementary colors” (colors across from each other on the color wheel) to add drama, but always pull in a few shades to right and left to build depth and sophistication, eliminate a look that is too “matchy-matchy”. To keep things serene, stay with soft hues of colors. Add depth in warm neutrals like grays or browns. Balance intense colors it with white or other neutral. If you don’t want to overwhelm the space with a bright or intense color, use it sparingly as a pop of color or accent. Wood floors act as a neutral and can work with many other color choices. However, be sure to note if your floor has warm or cool tones, and select rugs and furniture that works with it. When in doubt test your ideas, get a color swatch of the furniture fabric to take home and compare to the elements you already have in place. Or when shopping for a rug, bring a pillow cover with you that you are looking to match. If all else fails, create an idea board with clipped out photos or on Pinterest so that you can see the items side by side and decide if you like the way the pieces work together. Experiment, play and have fun!